So, as I noted, we’d decided to dig out pop’s old – and I mean old; the last time it was even in the water I was like four – catamaran on Thursday. Chris came down for the occasion, and Friday morning I arrived at nana & pop’s to get started (after a swim of course; I decided to be nice and save water by skimping on a shower 😀 ). When I first walked into the shed though, I immediately thought “oh dear god, what have I gotten myself into?”. I’d managed to convince myself that it somehow wasn’t nearly as bad as it in fact was. Nonetheless, I set about the task of clearing it out. At first this meant sorting out the dozens of empty boxes that formed the highest layer of the strata. I started filling those with junk to throw out, and pushing those out the garage door. It wasn’t long before no one could get through the door because of all the junk blocking it. There were a few problems with the catamaran itself, aside from the fact it’s been buried for most of my lifetime. The crossbar between the two rudders had come out of one – the wood has perished – and so steering is presently a two person affair. There was also a cover missing from one of the four openings into the pontoons, which we assumed would be somewhere in the garage – and may still be, of course; much of it remains unexplored – but we didn’t find it during the initial excavation. That’s aside, of course, from the sorry state of the trailer it sits on… the tires have been flat for pretty much ever, and are so old that they’ve solidified in their current shape. Thus, when we finally did drag the thing out, it was like it had square wheels – it took some effort to get it off the flat bits, and then it rolled surprisingly well – until it hit the flat bits again. 🙂 It was also a bit hit and miss as to whether it would roll at all – the axle seemed a bit stiff on the left hand side, which was entirely unsurprising given the whole thing is now merely a few iron shavings suspended in solid rust. Although they certainly made for an interesting look through… school shoes back then cost $8.55. School supplies (presumably books, stationary, etc) cost a total sum of about $3. Very few things cost more than $10, at least that they bought… I guess a week’s groceries were probably less than $10 back then. Then there were the two shopping bags of matches. Nana & pop used to collect them when they travelled, I’m told, and evidently they didn’t make it as far to the rubbish bin as nana had thought. There must have been thousands of matches in those bags. Now, to an outside, impartial observer, does it seem highly intelligent to place two bags of incendiary devices at the bottom of a giant pile of highly flammable crap? Right next to tins of turps and oil? Underneath oily rags? And if that wasn’t enough, we found two buckets packed full of kindling. Why? I don’t know; pop complains all the time about the endless battle he has, trying to burn off all the green waste they somehow collect. And then there’s the books. Bags and bags of books… such as a Young Men’s encyclopaedia from some sixty years ago, or a whole collection of books on natural home childbirth from the 1950’s. Of course if you want something slightly more recent there’s also a box full of 1980’s Mills & Boons… scary stuff. There were some quite interesting books as well, in that “oh dear” kind of way. Such as one that proposed that the asteroid belt between Mars and Jupiter is all that remains of Planet X, destroyed by a nuclear war with Mars. In fact, the craters we see today on Earth, Mars and our moon may look to the untrained eye like they were caused by meteorites, but don’t be fooled! They’re really the impact craters of nuclear weapons and galactic shrapnel. It’s a well supported scientific theory that has 200 years of evidence behind it, and makes far more sense than any of those other silly theories. Let’s see, what else did we find? Well, there was the wine-cooler polystyrene esky with a giant hole in the side… it would seem reasonable that such an injury would relegate the esky to the bin, but apparently not, when it could instead sit in the shed and biodegrade over the next 100,000 years. There’s good composting in polystyrene. Oh, and there’s a Steriophone in there as well. No FM – probably hadn’t been invented yet – but I would be very surprised if it didn’t pick up shortwave a treat. 😉 It has a built-in record player, I’m told… and my dad suspects it might actually be so old now as to be worth a bit, if properly cleaned up. There’s certainly no point keeping it around – I can’t imagine nana ever agreeing to let it back in the house, and from it’s position in the garage I’d say it probably went in there almost before I was born. Behind that was an old TV, which would be black & white I’m sure, and I doubt works at all… and I thought the old and old old TV’s that are in the house were old! What else… ah, yes, bottles. Just before Christmas one of the shelves at the back of the shed fell down. Nothing wrong with the shelf itself – the screws just plain fell out of the mortar, which is old and crumbling. The shelf naturally held bottle upon bottle of screws, nails, bolts, who knows what… pop then worried about gathering jars to replace the broken ones, because of course he had to sort through the mess to recover every item. Andrew & he sat outside on Boxing Day, I think it was, going through the pile. And yet, as it turned out, not only is there two whole boxes of empty bottles, but there’s at least a dozen just lying around on the ground under the catamaran itself. Right on top of the dozen or so empty bags of pool salt, which may well be every bag pop’s ever bought. There was also the hideous old floaty thing that I was made to wear – despite tremendous protest – when I was very young, in the pool. It was way too tight, and massively unwieldy, such that it made it virtually impossible to actually swim properly and was quite possibly a drowning hazard. Extension cords. I’ll never buy one again – I reckon there’s enough in that garage to run a line from the house down to the beach… I cannot fathom why someone would have so many extra length extension cords. There was nothing wrong with any of them, aside from the fact that one would most likely be entirely sufficient. Then there’s the old pool cleaner hose, which – while split almost clean through in at least one point – was still in there for reasons untold. Just like the old aluminium rod that was once the old pool skimmer… it has no purpose, but since there’s strictly speaking nothing wrong with it, I doubt it’ll ever be thrown out. There was just so much old junk in that garage… and still is; we hardly even started on the other half of the mess sprawled upon the table-tennis table. I’m planning to go back round there on Monday or Tuesday to at least do some tip runs with all the garbage, and possibly continue cleaning out the garage. It would actually be interesting to see how the table-tennis table (redundant? tennis table?) is doing… dad reckons it’ll be horribly warped and next to useless, but it really didn’t seem to be in that bad a condition from what we could see of it. He also wouldn’t believe at all that the catamaran actually floated, and wouldn’t take on water. But indeed it did, and didn’t. Which brings me to of course the surprising twist at the end of all this – once the catamaran was out of the garage, pop, Chris & I were able to easily lift it off it’s trailer, over the pool fence, and straight on into the pool. As I noted I’d had high expectations of some colossal disaster, which were completely shattered by the anticlimatic reality – it floated, just like it should. When we checked the pontoons, there was no sign of any water leaking in. 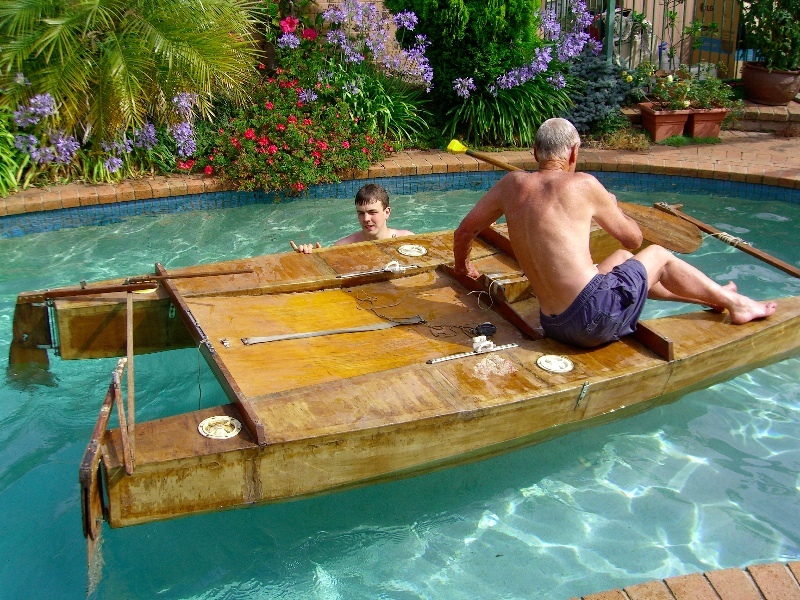 We only had it in the pool for twenty minutes or so, which isn’t enough time to show up seepage, but it’s enough to give pop & myself the confidence to now go ahead and fix it up, ready to sail in the actual ocean (well, bay at least). Previous Previous post: There’s a boat in there?! Next Next post: Men Can’t Communicate?